After chasing three times, we have a post mortem appointment. The 8-10 weeks “on the safe side” estimate has ended up being an 11 week appointment, but I’ll overlook that. I’ve been focusing on just getting the appointment so much, that now we have it, it’s time to get my head around actually walking back through those doors and sitting down opposite our Consultant and discussing it all. Scary doesn’t even cut it. I just keep reminding myself that I’ve been through scarier moments in that hospital. I’ve mulled questions over in my head for weeks now from the absolute silliest to the hardest ones to say without crying. We need to sit down and make a comprehensive list which will most likely have headings and sub-headings and all sorts… Before, during, after. Thanks for your help Google, but no, I did not mean that. Even Google thinks this situation is ridiculous. Anyway, I’ve digressed and I was attempting to keep this brief. I was hoping to canvas opinion and the benefit of hindsight. What do you wish you asked? How did you prepare yourself? 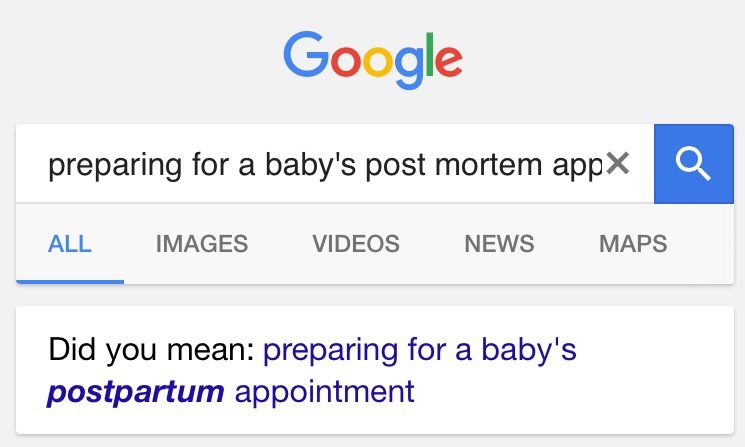 My Google effort – granted I couldn’t handle going through too many pages as most was information on the actual examination itself – mainly provided an old, although somewhat useful, Netmums thread on the subject. I also thought that it may come in useful to put all the hints, ideas and tips together into a post for other people’s reference? Please do comment if you want to – it would be really appreciated. I asked that before she talked me through the report, that I read the report alone to note any questions. Then when she talked me through I noted questions I had from her, and was able to work my way through the full list. Thank you for commenting, really appreciated. It seems to be very varied at which point people get access to the report. I’m not sure we’ll get the opportunity to read before but I will reread it afterwards and I know we can put forward more queries. It’s useful to have time to digest isn’t it? Many thanks again. I think it would have helped for us to be able to read it as well. I had researched a lot going into the meeting but still found myself full of questions once I got home. I have to say, that even though I did read the report and took my time to be as methodical as possible, I still had questions popping into my mind days, weeks and months later. I think the whys will always plague me. Hmmmm… I feel like my OB went over everything in so much detail that I didn’t have too many questions. We definitely stopped her anytime we had a question though – don’t be shy. There’s so much medical terminology in the report that it’s often difficult to comprehend without assistance, so it’s good you have this appointment. If they brush over the cord and placenta findings, I’d definitely specifically ask them to address all those, grill them if you have to. I have a friend who’s 12 weeks pregnant with her rainbow, and it’s only now she’s finding out her son’s placenta was small and carried an infection. I guess her doctor found it okay to not disclose this to her – like WTF?!? Geez – eff you Google. Also, your Consultant – I can’t believe she hasn’t followed up with you since losing Leo. Well, actually I can believe it, because my MFM doc never followed up with us after Matthew died. He never offered condolences or anything… I promptly decided I’d never be seeing him again. Thinking of you as you head into this appointment. Thank you Christine – I’m determined to get as much as possible out of this stage to make sure we as informed as possible. That’s concerning to hear about your friend and them not disclosing such important issues like that, and to discover it at this point isn’t settling… I will be pushing on the placental details as I’m led to believe this is a factor and a missed issues from their part, but we shall see what their take is on it all. I’ve been quite shocked that they haven’t been in contact, a letter would suffice. Just to break the ice before the appt if nothing else! I’m not too keen on seeing her in the future, and will attempt to avoid her where possible at the fertility clinic too – but doubt it’ll be easy. There isn’t a great deal of choice with these things unfortunately. Thank you for commenting, really helpful.